Frequently Asked Question: How do I punctuate a bulleted list? As bulleted list enthusiasts, we often get asked about how to punctuate them. Style guides are all over the place on this issue, but we like to keep it simple (no surprise there). That’s why our answer is: Whenever possible, don’t punctuate bullets in consumer health materials. 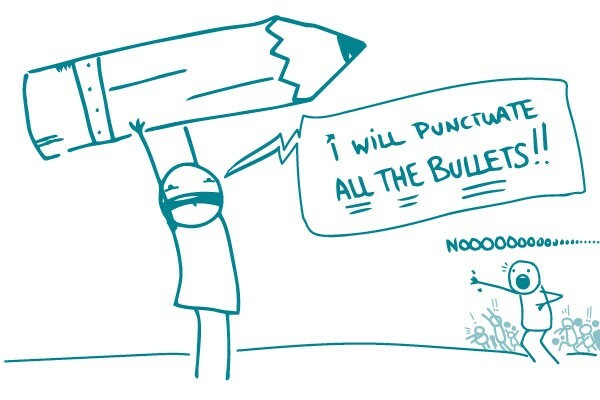 If you have a list of things or incomplete sentences, never punctuate them. If you have a list of complete sentences, you really don’t need to punctuate those either. See? Clear information, no punctuation needed! If you feel like your list isn’t clear without punctuation, rethink it. Does the information need to be broken down into smaller chunks? Is it more appropriate for short paragraphs than a list? And please, whatever you do, don’t use semicolons. The bottom line: Keep your bulleted lists simple and skip the punctuation.